Is Hampton Court Palace Haunted? 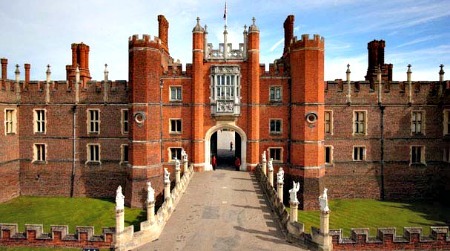 Hampton court palace was originally built in 1514 for Cardinal Thomas Wolsey who was a favorite of King Henry VIII. Though after he fell from favoritism the palace was passed into the hands of the king who made various additions to the building. The palace appears to be in two different styles of architecture, which is Tudor and Baroque due to King William III's huge expansion project which was suddenly halted in 1694 leaving the palace's expansion project unfinished. The palace has not been occupied by the royal family since the 18th century, and is now open to the public as a tourist attraction. If you wish to visit the palace please check with the venue directly to check any seasonal opening times. The most well known ghost at the palace is thought to be that of Catherine Howard, who was the 5th wife to King Henry VIII. She accused of having an affair by her husband and under the charge of committing adultery she was placed under house arrest and confined to her room. One story says that while she was confined to her room she managed to escape and made a run for it through the palace, only to be caught by the guards and dragged kicking and screaming through the gallery back to her room. She was eventually executed in the tower of London and is thought to have come back to the palace she so dearly loved. Staff and visitors alike have reported screaming coming from the gallery when no one is present there, and during one evening in the year 1999, two female guests on different tours fainted in the exact spot the screaming is known to come from. The next ghosts at the palace is commonly known as the "Grey Lady", and is thought to be the spirit of Sybil Penn, a servant to the monarchs of the house and the nurse of Elizabeth I. She eventually died of smallpox within the palace after caring for Elizabeth I when she was suffering the same disease. She was buried at the palace but reports of her ghostly activity were not known until her tomb was disturbed in 1829 when it was being moved. Strange noises have been heard in the area were her tomb was along with the clock court and state apartments, which include that of a spinning wheel constantly turning which has been present during many tours of the palace. During one of the clear outs of the palace a spinning wheel was found which was matched to the date that Sybil would have been alive, but this may very well be a coincidence. 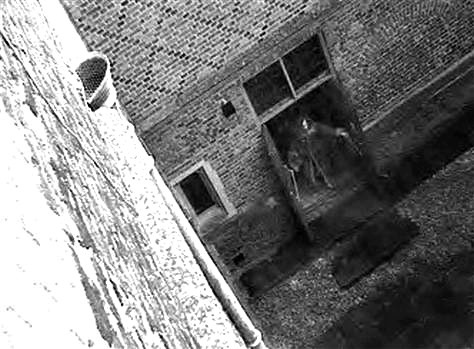 During the winter of 2003 security footage at the palace showed some interesting but rather terrifying activity. Many of the doors within the palace are very old and very heavy thick oak doors, and on the security footage these doors would suddenly fly open with a huge amount of force, only to reveal nothing on the other side which could have caused them to do so. The next day the same thing happened and this time the cameras captured a ghostly mist like figure on the other side of the door, which some people believe to be the spirit of King Henry VIII himself. The cameras captured the doors flying open again on the 3rd day, but no figure could be seen. Many of the palace's staff and visitors have claimed to have seen the apparition of a large man standing close to or within the arch of the doors.